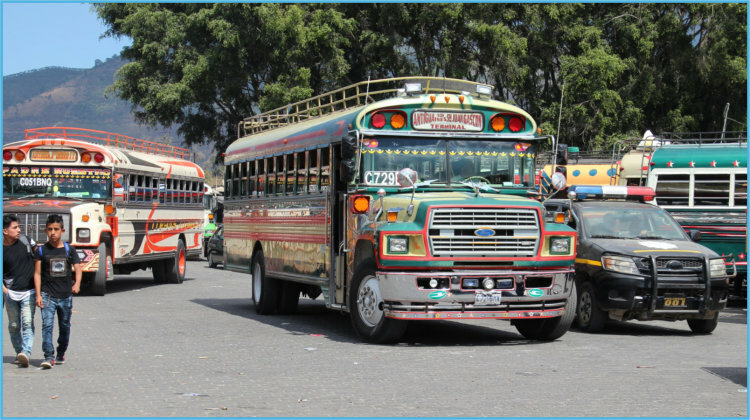 Antigua is in a highland valley at about 5,000 feet and is surrounded by Volcano Agua (12,400'), Volcano Acatenango, and the active Volcano Fuego. 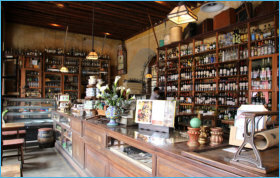 A visit is like stepping back in time over hundreds of years. 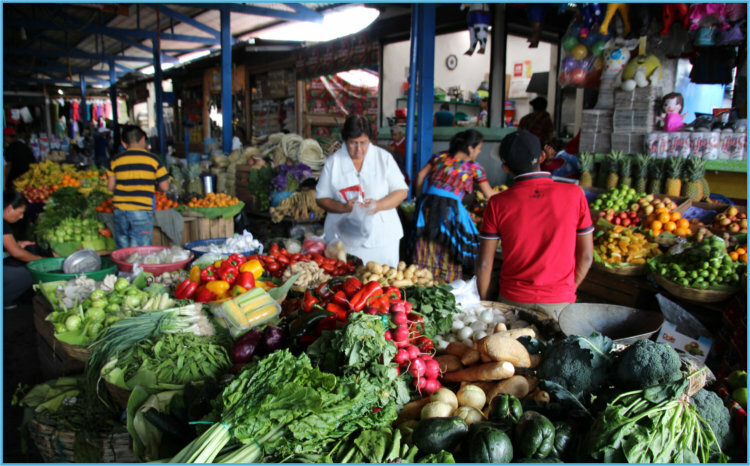 The 2.5km square city centre is full of historic buildings, monuments, fountains, ruins and artisan markets. It’s interesting to see so many, and such a variety of religious churches in such a small area. Amongst the beautifully preserved examples of Spanish Renaissance art and architecture we saw many ruins that are a result of the major earthquakes of 1717, 1773 and 1976. Antigua is very compact and easy to walk around. Most tourist destinations are in an 8-by-8 block area less than 1 km across. The cobblestone sidewalks are narrow and not always in good repair so you often have to walk in the street with traffic whizzing by you. We set off on a 14km guided morning walking tour of this beautiful city. We enjoyed Antigua very much and wished we had spent more than our three days there. A large cross is prominent on a hill to the north of the city (Cerro de la Cruz). It is a pleasant, moderately strenuous 30-min walk to the cross from the Parque Central. On a clear day there is a fine vista over most of Antigua and the Volcán de Agua rising high to the south.. (The image at the top of this page was taken from the Hill of the Cross). 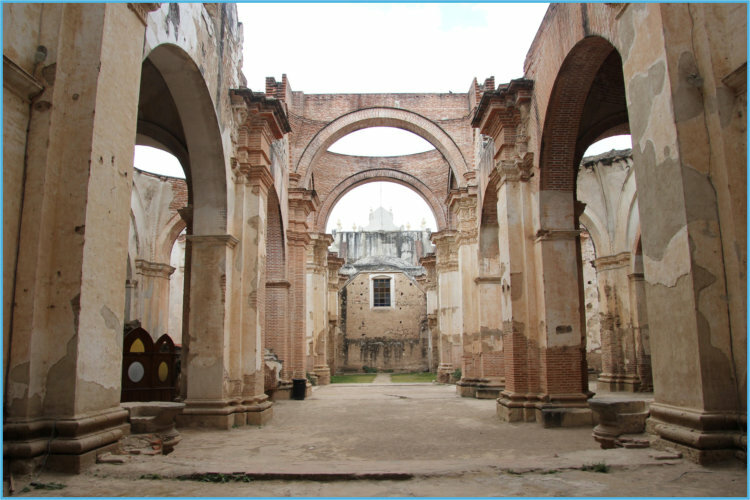 Built in the 17th century, it originally connected the Santa Catalina convent to a school, allowing the cloistered nuns to pass from one building to the other without going out on the street. A clock on top was added in the era of the Central American Federation, in the 1830s. 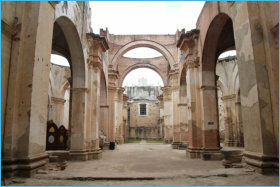 The cathedral is composed of two areas: the plaza-facing narrow church building still used for ecclesiastical functions and the empty shell of the main cathedral, once grand and full of glory and now roofless and filled with sad chunks of stone. Seeing the finely-worked walls and columns, floor strewn with debris and light flooding in from above, is unsettling and yet makes for one of the most atmospheric experiences in Antigua. The Bus Station West of the market is the very busy bus station. It’s interesting to stand and watch the buses come in and out of the station with precision to avoid huge traffic jams. 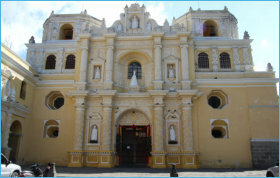 The 1548 Nuestra Señora de la Merced convent-church was the third convent, from the congregation named the mercedarios. They began to establish monasteries throughout the Kingdom of Guatemala. Inside this convent-church is preserved an image of Jesus Christ with the Cross, which is considered one of the most beautiful images in the country and attracts a large numbers of churchgoers every year. In 1607, a group of friars from La Compañía de Jesus established a monastery and school. It was a simple building. In 1698, the religious built a new building, which was one of the most impressive in the city, since it had a church, a monastery, two cloisters and a school. In 1767, King Carlos III ordered the expulsion of the Jesuit friars from Spanish America. 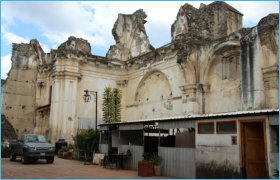 The Church and Convent of the Company of Jesus suffered considerable damage due to the earthquake that occurred in 1773. The church is now in ruins and closed to the public, although a few craftsmen have ‘sheds’ inside of the ruins. The 16th century San Francisco Church is one of Antigua’s oldest churches, and one of the most frequented sanctuaries by the local population because of the shrine of Central America’s first saint, Hermano Pedro of San José of Betancourt. 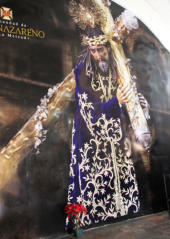 He was a Franciscan monk who came to Antigua Guatemala from the Canary Islands and founded the Hospital of Belén. He is credited with miraculous healings. In the south side of the church, is the Hermano Pedro museum along the ruins of the adjacent monastery. It has church relics and some of the Hermano Pedro’s well- preserved personal belongings. The Market The market is open every day, but is largest on Saturday, Monday, and Thursday. It is a cultural experience – it is big, like a maze, and you will likely lose your way especially as it is dark in the covered areas. 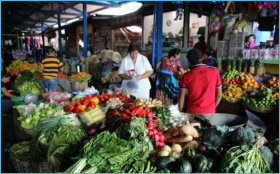 There are areas of fruit, flowers, general goods, mini restaurant and even second-hand clothes. Almacen Troccoli Restaurant This was our favourite restaurant with a quirky decor that is a mix of a wine bar and antiques from its day as a hardware store. It’s very atmospheric and extremely interesting. Tables look out onto the Arch Street so it’s very pleasant to eat and sip a glass of wine whilst watching the world go by. Excellent food and good wine prices. So good that we went back again. 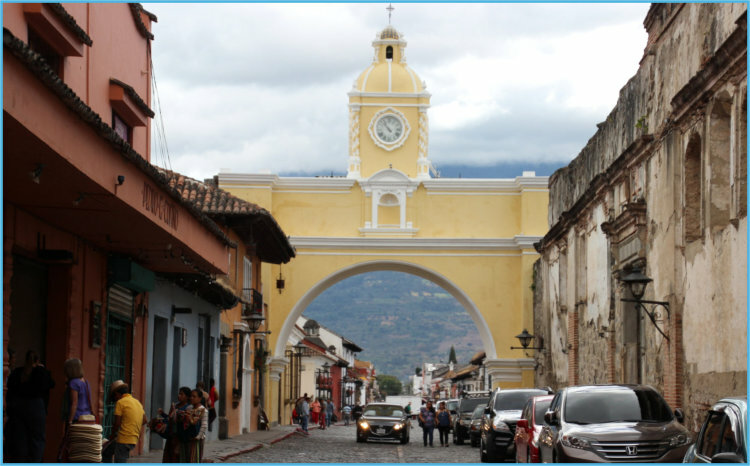 Founded by the Spanish in 1543, Antigua was the third capital of the Spanish Kingdom of Guatemala for over two centuries. 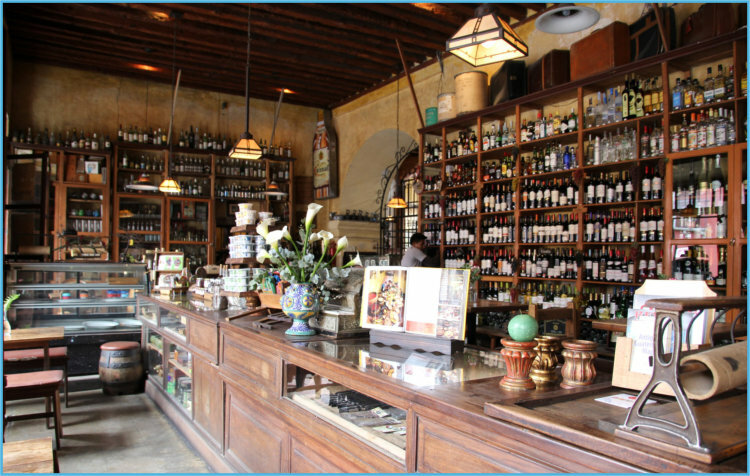 That is why the region’s architecture has a European style from the colonial times. In 1773 a disastrous major earthquake damaged most of the city and in 1776 it was ordered to be abandoned as the capital moved to the new Guatemala City. Not everyone left, but from a bustling capital it became a provincial town, filled with the ruins of former glory. 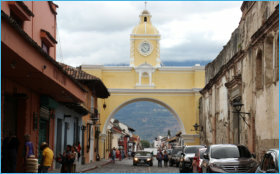 It became known as "Antigua Guatemala", meaning "Old Guatemala". 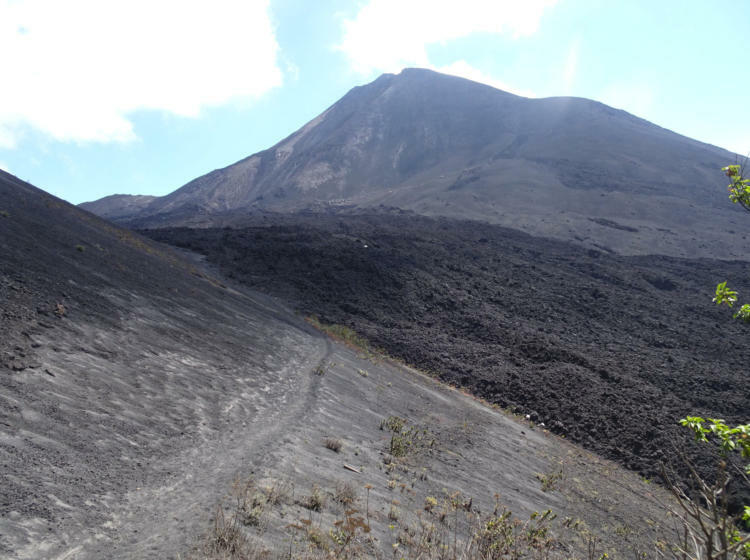 We hiked up the Pacaya Volcano which is a part of a chain of volcanoes stretching along the Pacific coast of Guatemala, formed by the subduction of the Cocos Plate underneath the Caribbean Plate. The caldera has been the source of very large explosions over the last 300,000 years, erupting a total of about 70 cubic kilometers of magma. The hike is moderate except for the last 100m or so that go over very loose lava rocks (climbing up to the crater is currently not allowed). We did a circular trail from the far side and descending down the wide track. Horses are available to hire for those in less physical condition. 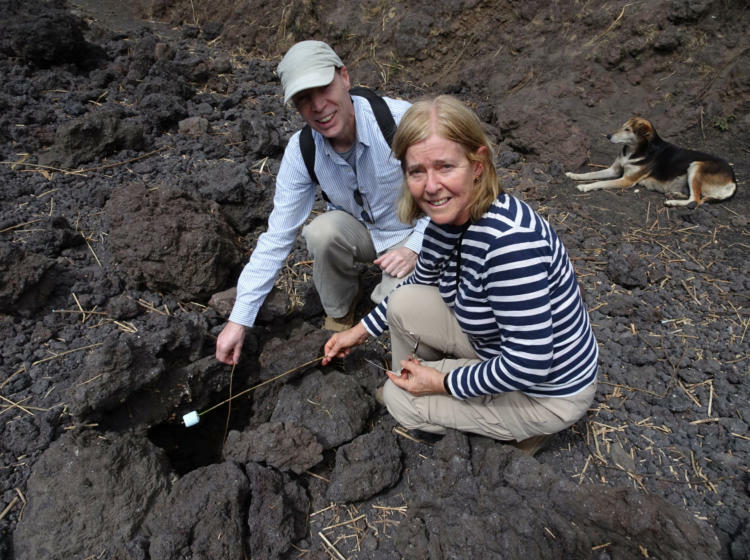 As of early 2016, there is no hot lava left from the 2010 eruption but you can still roast marshmallows over vents and see the massive mounds of cold lava. 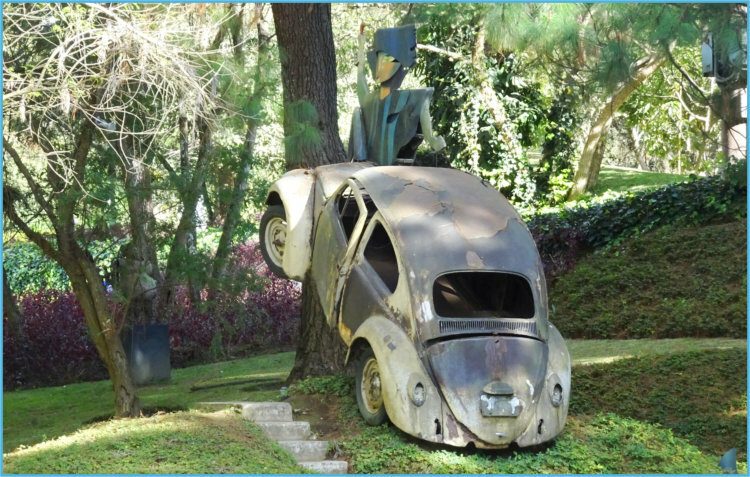 A place for nature and art lovers with stunning views of Antigua and the volcanos. The art in the grounds is inspiring and plentiful (it’s free to visit). There are permanent sculpture installations and galleries that rotate collections. 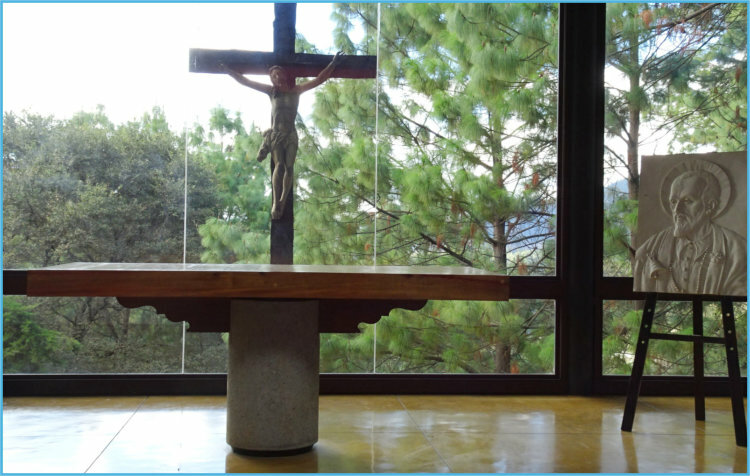 The church is nestled in the trees with glass behind the altar to take advantage of the view. This beautiful, artistic place has been created by the owners of the Casa Santo Domingo in Antigua (where we stayed). The food and service were good, albeit a bit expensive. 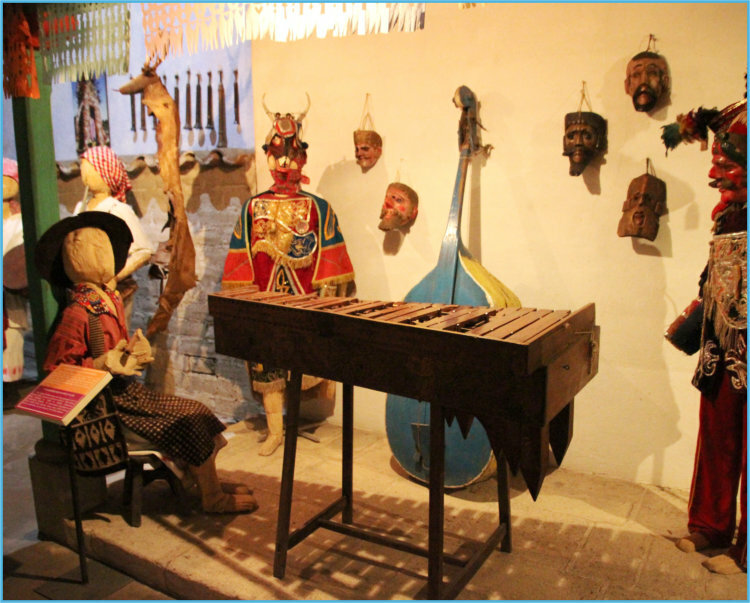 We visited the Azotea coffee farm and cultural centre where we wandered through the gardens, saw the coffee production plant and were educated by the exhibits about the history of coffee in Guatemala with an explanation of the growing and processing of the beans. 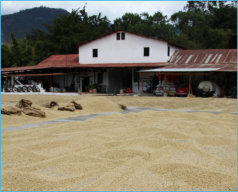 They grow only the Aribica coffee beans. La Azotea plantation was originally a farm growing an insect used in making red chdye. The invention of chemical dyes eventually collapsed the conchineal industry. 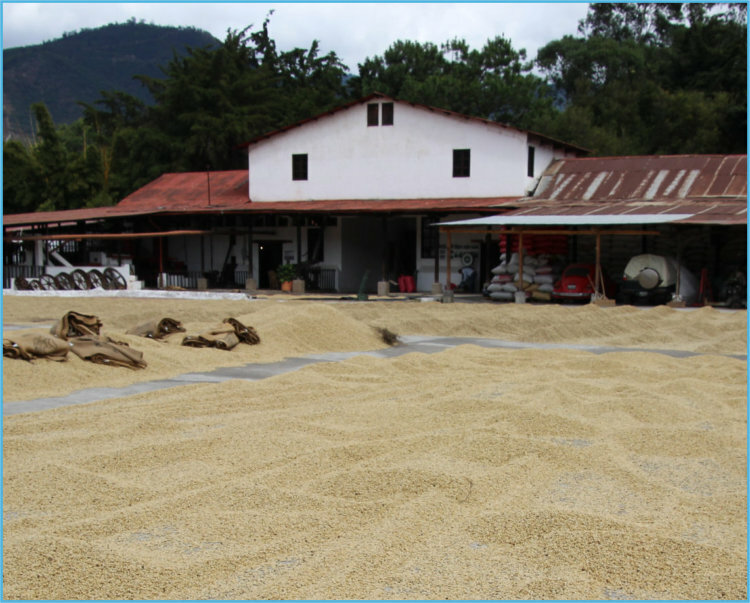 In 1883, doña Dominga Mont purchased the plantation and her son-in-law, don Marcelo Orive, converted it to the cultivation of coffee. Nearby Villages We visited the villages of San Antonio Aguas Calientes , Santiago Zamora, San Juan el Obispo, San Miguel Duenas and Cuidad Vieja. Cuidad Vieja was the second site of Santiago de los Caballeros de Guatemala, the colonial capital of the country, founded by the Spaniards in 1527. It was destroyed by a mudslide with giant rocks from the Agua volcano in 1541. 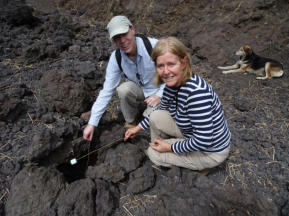 It was said that the cause was a breach in the volcan crater, but this is disputed as the break is on the other side and water could not have got into the town – more likely it is due to the exceptionally heavy rainfall. (The capital then moved down and along the valley to Antigua.) 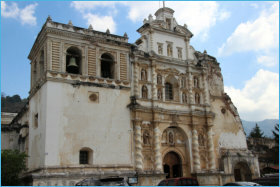 The church is the oldest in Guatemala.